The Southern California Genealogical Society (SCGS) and the International Society of Genetic Genealogy (ISOGG) took a big risk last year, adding a full day of DNA presentations — “Family History and DNA” — to the already-successful SCGS Jamboree. Nobody had ever done that. The costs involved were substantial. Would it work? Could it work? 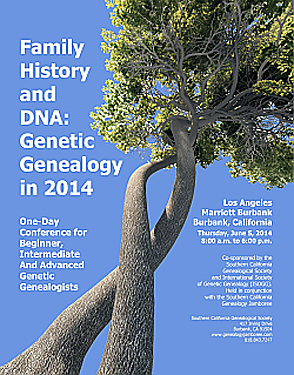 Could a whole day of genetic genealogy education be successful? The answer was: beyond anyone’s wildest dreams. SCGS and ISOGG have announced the 2014 Family History and DNA as a prequel to this year’s 45th Annual Southern California Genealogical Society Jamboree. It’ll be held on Thursday, June 5, 2014, at the Los Angeles Marriott Burbank Airport, so if you were kicking yourself for missing this in 2013, here’s your chance. There’s enough on the schedule for the 2014 DNA Day to keep anyone with even a mild interest in DNA testing — from beginner through advanced — occupied practically from dawn to dusk. Katherine Hope Borges, co-founder and director of ISOGG and a moving force behind the growth of the use of genetics in genealogy. Dr. Kathryn Johnston, a retired dermatologist, who’s been doing genealogical research for more than 25 years. Oh, and me. Yup, I’ll be there and loving every minute of it. I get the beginner track again, doing what I love to do: introducing people who aren’t familiar with it to autosomal DNA testing. The full line of speakers and topics is on the SCGS Jamboree website (here) and you can register online here (follow the links to DNA and Family History in the left). And there’s even a discount for folks who register for both DNA Day and Jamboree. Will we see you in Burbank? Though I’m sure most of my readers are already followers of you, so you won’t pick up any new fans~ but at least know you are appreciated! Greatly. Thanks so much for the kind words, Nicholas. Two more options for you: there’s a NEW DNA Day coming up at Jamboree this year, and there’s a beginner course in DNA and genealogy planned for next January’s Salt Lake Institute of Genealogy (with an advanced course coming up this summer at the Genealogical Research Institute of Pittsburgh). LOTS of ways to learn!